Adversarial Rehabilitation. Does it have to be this way? In preparing to meet my brand new client, I had read through all of the documentation that the insurer had sent me; I was clear on their brief – help this man get back to work in a new job. I understood, from paper what his illness experience has been to date, and had some idea of what his skills for new employment might look like. He was pleasant to speak to on the phone; he appeared motivated and interested in meeting with me and asked what he could bring. Of course, I suggested he bring a current resume, any medical reports that might be useful and some ideas about what types of help he would like from a Rehabilitation Provider. We meet and we start the discussion about where he is at right now, what he thinks he needs and how I can potentially help. Things were going great until he says…..
Oh, I exclaim, that’s not really how we work. Well, I start, a little cautiously, because I’ve heard this response before and it doesn’t tend to end well….. our philosophy is that we will teach you what you need to do to be able to go and get a job, knowing how to manage any limitations or barriers your illness might present along the way. After all, we don’t want you to need us again should you want to change jobs; we would like you to remain independent and able to navigate your own career. That’s not what I was told, retorts the client. I was told by my insurer that you would FIND me the ideal permanent job (lots of emphasis on the word permanent). And we all know that permanency in the world of work is not like it was 5, 10, 20 years ago. · My treating doctor says I can work 4 hours a day, 3 days a week, so I need a job where I can work those hours. · I also need a sedentary job which means I have to sit all day. · I need you to go to employers and get me this job. · I need you to convince employers that I can do the job, but I may need extra time away from work because my illness symptoms are unpredictable and I might not be able to come in on some days. · I need you to make sure the employer knows about my condition and will be supportive and not give me any grief if I can’t keep up with the work or if I get stressed. · I need to know that this is a permanent position and that as my health improves the employer will give me the extra hours. I inhaled deeply, as I know that we now have an adversarial problem. This client has been led to believe that I have a magic bucket of jobs and I will pull the IDEAL job out of this bucket and then he will be the perfect candidate for this job and all the accommodations he has ever dreamed of will be created for him, because I will get him this job, because the insurer said I would. We know, fellow Rehabilitation Professionals, that this world of work does not exist. Today jobs are increasingly competitive, people are required to have more than just technical skills – they need negotiation skills and sound emotional intelligence to be able to participate in our work force. Employers are increasingly skeptical of “injuries”, “ disabilities” and “ accommodations”. Not because they want to be discriminatory, but because they don’t know what they don’t know and the candidate who turns up with a wishlist of accommodations for the role is likely to be overlooked for the equally qualified, experienced but not-so demanding candidate. We have an ongoing problem in rehabilitation where clients turn up expecting someone to do it all for them. And I can understand why this level of dependence is developed. The day before an injury or illness, they were totally in control of their life, making all of their own decisions – then whammo, someone else is making all the decisions. There is fear, often pain and often blame. Clients often perceive that they have done nothing wrong, and that it wasn’t their fault that they got sick or injured. Therefore, it isn’t their fault that they now don’t have a job, and so it is someone else’s job to get them a job because it’s not their responsibility. 1. I don’t get people jobs I teach them how to get jobs. 2. You are not work ready, therefore we need to get you work ready before I can “place you”. 3. You need adjustment counselling. 4. You need an exercise program. I don’t know about you but right now I’m thinking, this client’s motivation to participate will wane (not that it was strong to begin with); they feel that their insurer has led them astray (the insurer more than likely hasn’t – but with so much lost in communication, the client has heard what they wanted to hear, or what they were afraid to hear) and now I have to get this person into a new job when he has all of these barriers and the type of workplace he wants just doesn’t exist. Yet, somehow, we have created this adversarial experience. No doubt as soon as the client leaves the interview, they call their insurer and rather loudly tell them that they have failed them again, and they can’t trust that and that rehab provider is useless and won’t do anything for me. The insurer will then call the Rehabilitation Professional, and ask what on earth did you do to my member and why can’t you help them? The rehab professional will then explain, Dear insurer, this client isn’t work ready and you need to spend money on a lot of treatment before he will be work ready. How could things have changed here? How can we consciously create a non-adversarial environment where each key player in a client’s recovery process is respected, is heard and where all of the assumptions can be addressed and where each person can and will take responsibility for their own part in the recovery process? · The answer isn’t – let’s get rid of the lawyers. · The answer isn’t – get the insurers to explain what it is rehabilitation professionals can’t do. · The answer isn’t – just send me clients who are fit for full time work and work ready. So, if those ARENT the answers, what are the answers? 1. 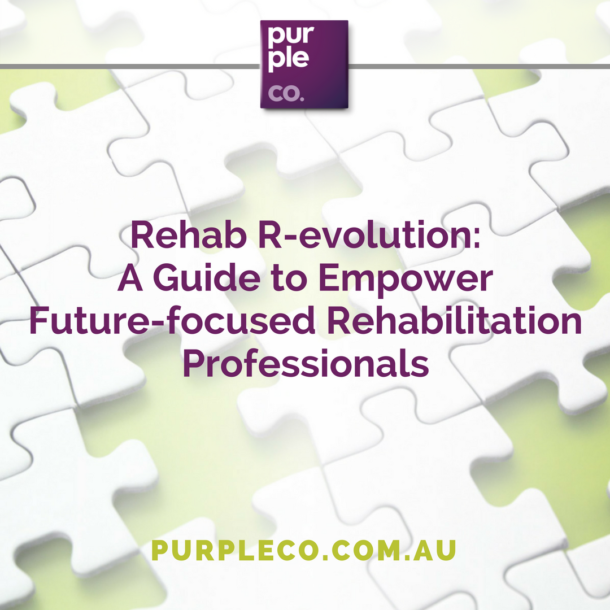 Rehabilitation Professionals can help by improving their capacity to have curious conversations with clients instead of, ‘we have to get this done by this date’ conversations with clients. By creating an environment for engagement and participation we will facilitate the client to take back control and ownership of their own recovery, rehabilitation and RTW process. After all isn’t this all about the client? 2. Rehabilitation Professionals can clarify with insurers or third party referral sources, as to what they have explained to new clients our role is and how we can help. It’s not the insurers responsibility to market us to the client, that’s our responsibility. It’s our responsibility to ensure we have rapport and relationship with our third part referral sources so they know how to refer. After all an insurer or third party referral source does not want to have to deal with an untrusting, unmotivated, cranky client. 3. And can we as Rehabilitation Professionals actually keep up with the world of work. Meaning keeping up with trends and changes to the way employers recruit; what employers want from employees in addition to their technical skills and know-how and learn how to express to clients that the only real permanency in today’s workforce is having the knowledge and skills and capability to be able to move from one job to the next independent of a Rehabilitation Professional. And we will see rehabilitation change from being a cost-drain to a value-add to anyone who has experienced injury, illness or disability. And this is what GODD rehab is all about. And doesn’t that sound just wonderful……..